Same as the Kernel Kutter below, but comes with the corn bit. Chuck the bit into your electric drill and away you go. Watch the video to the left and see how it works. You will not believe how fast, fun and easy it is to strip all of your corn, and your neighbors too! Kernel Kutter ( without Bit). Stainless steel expandable blades, steel handles. One swift downward stroke strips the entire ear. You can strip hunrdeds of ears in an amazingly short time. This great utensil is a 'must have' for freezing, canning, making fresh salads or for dentally challenged individuals. Isn't summer great when there's such an abundance of fresh fruit and vegetables? Too bad we can't have truly farm fresh food year round. But now, with the KERNEL KUTTER CORN CUTTER, you'll be freezing as much corn as your freezer will hold quickly and easily. After a four or five minute blanching, you'll be whizzing through dozens of ears stripping the kernels off faster than you ever thought possible. With just a little pratice, you can be processing 10 dozen ears in 15 minutes! 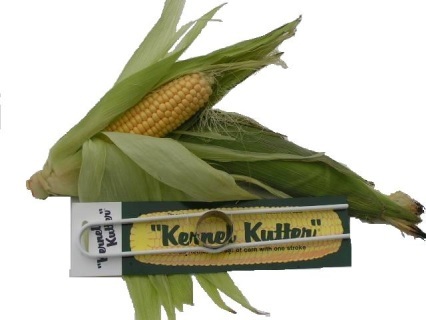 Freezing fresh sweet corn is not the only way you'll be using the KERNEL KUTTER CORN CUTTER. Small children sometimes have a difficult time figuring out how to nibble those sweet kernels off the cobb. And then there's the adults that don't want to give up such a tasty, healthy vegetable just because they happen to wear dentures. Now both can enjoy summer's delicious treat along with eveyone else. The KERNEL KUTTER CORN CUTTER makes it so simple to strip the sweet morsels of 'gold' off the cob. Much quicker than the old fashioned method of cutting with a knife, turning a little bit, cutting again, turning...etc. With one stroke, ALL the kernels are stripped. THAT'S IT! Imagine how delicious your recipes will taste using FRESH sweet corn. From scalloped corn and homemade relish or salsa, to succotash and healthy cobb salads. All cooks know how important fresh ingredients are. Using the simple KERNEL KUTTER CORN CUTTER will not only be quick, but insure the quality of the meals you serve your family. 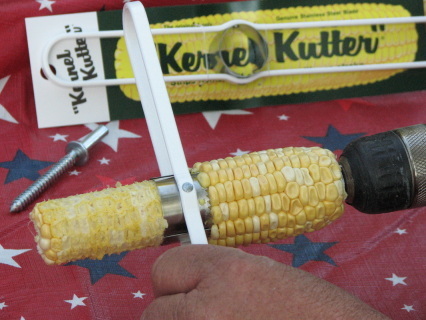 This is the original, trademarked KERNEL KUTTER CORN CUTTER. It has been sucessfully processing corn for over 50 years. The KERNEL KUTTER CORN CUTTER strips the entire ear of corn with 1 stoke, not 4-5 strokes like most other corn cutters. With a little practice, this time tested kitchen gadget will strip 120 ears of corn in 15 minutes. Two self adjusting stainless steel blades will automatically adjust to any size ear of sweetcorn. One rivet per blade allows for full adjustment. The KERNEL KUTTER CORN CUTTER was designed with your safety in mind. When using the KERNEL KUTTER CORN CUTTER both of your hands stay on the handles and away from the cutting blades. Not at all like the "slide the ear over the exposed blade" types of cutters. The handle is steel, and not plastic that you might find in some of the lower priced, copy cat cutters. The KERNEL KUTTER CORN CUTTER is dishwasher safe for easy clean up. We do not recommend using the cutter on raw corn, UNLESS YOU ARE USING THE CORN BIT. For your cutter to work properly, make sure the corn is blanched or fully cooked. This will tenderize the fibers in the corn for easy removal. All of our products are made in the U.S.A..Another simple kitchen gadget...THAT REALLY WORKS! .